Prime Minister Narendra Modi on Sunday hit out at the congress for their pledge to protect cows in Madhya Pradesh, reminding the party that its workers in Kerala last year slaughtered a calf in the open.Addressing an election rally in Chhindwara, the Prime Minister also attacked Congress President Rahul Gandhi with the "naamdaar" jibe for "repeatedly lying" to discredit the BJP-led central government. 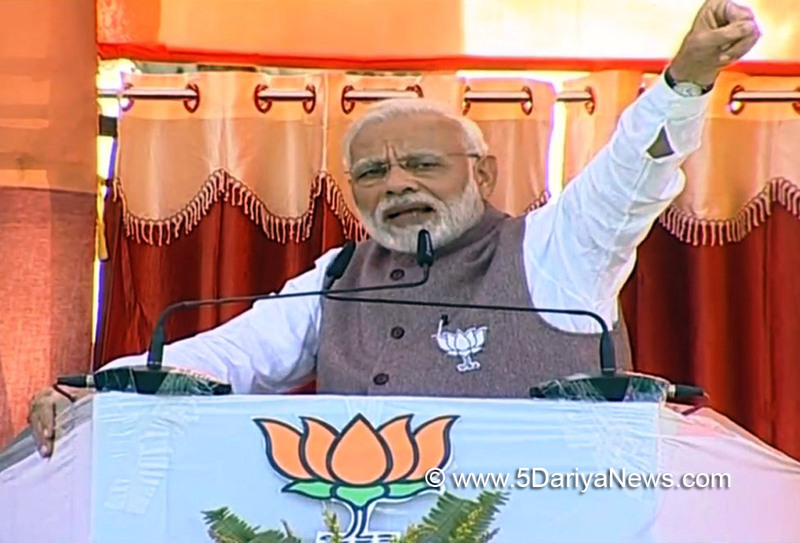 "In the manifesto for Madhya Pradesh, the Congress party is hailing the cow as a mother, but on the streets of Kerala, the Congress people cut off the head of a calf and circulated photos of their eating beef, saying that it was their right to eat cow-meat," Modi said.He said that the Congress included the issue of cow in their election manifesto to confuse the people. "I am criticising it. It is their right but the question that arises is whether the Congress of Madhya Pradesh and Congress of Kerala are separate. Tell the truth to the people. You may like cow or not, it's your prerogative, but don't fool the people," he said.The Congress in its election manifesto has promised to build gaushalas (cow sheds) in every gram panchayat, establish a new department for spirituality, open new Sanskrit schools, besides loan waiver for farmers.The Prime Minister said the Congress had promised farm loan waiver in Karnataka but has not yet implemented it. "They promise but do not deliver. Cheating is in the their blood," he said.Taking a jibe at Congress leaders for questioning the surgical strikes and allegedly using foul language against the army chief, the Prime Minister said that Rahul Gandhi is "confused", and the Congress under him is "fused". Using his trademark jibe of "naamdaar" at Rahul Gandhi, the Prime Minister said he was continuously abusing him because Modi has put an end to corruption by using technology. "Wherever the naamdaar goes, repeats the same cassette. If you have courage, give the account of your four generations. Modi is ready to give account of his four years," he said.